Ready to meet another Squid from the New Orleans Squidshack? Virginia Larkins, better known as Ginger, talked to us this week about her many interests, including her fund raising endeavors for the New Orleans Children’s Hospital. What did you do before coming to TurboSquid? 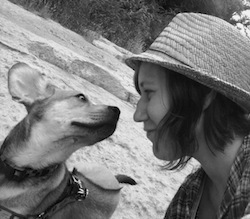 Well, back in Austin, I fostered dogs for Austin Pets Alive! I love dogs and having an extra pup around for my dog Gabby to play with was fantastic! It’s really rewarding work, even though you have to say goodbye to a dog you’ve cared for. I have also registered for a charity called Extra-Life. You watch me play video games for 24 hours, over a live stream, to raise money for New Orleans Children’s Hospital. This doesn’t go down till November 2nd, but you can donate your money here. And now that you’re at TurboSquid, what do you do as a QA Analyst? I write test plans, run automation (sometimes), check to see if issues reoccur, and generally try to break websites. The breaking things part of my job really rocks. What is your favorite thing about working at TurboSquid? Free food when we’re trying to release something in a crunch. I also love the cereal bar and the fact that new stuffed toys appear on my desk. Currently, there is a Dalek, a kitty, a farting Jarjar Binks, and a Companion Cube on my desk. I have the best stuffed toy fairy! Tell us about your favorite model from the site. Dinosaurs are cool! 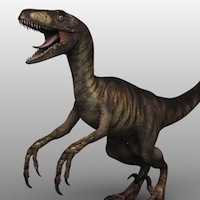 Also I liked the fact that this person titled it by its formal name: Deinonychus antirrhopus. Nice! Before we go, what’s something your fellow co-workers don’t know about you yet? I guess one thing people might not know about me is that I love archery. I’m not particularly great at it, but its one of those relaxing things I do on the weekend. My father would always set up a make shift archery range in our backyard for me and my sister. We’re excited about Ginger playing for this year’s Extra Life gaming marathon! To find out more about this charity, which benefits local children’s hospitals across the country, check out Ginger’s donation page.